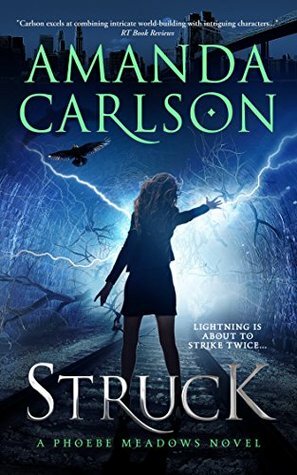 Struck appealed to me when I saw it on Kobo's free eBook list because of its use of Norse myth. On the whole, I thought these tales were incorporated well into the narrative. I liked Carlson's treatment of Fenrir and Jörmungandr. However, I wasn't as impressed with her take on Loki. To be fair, though, he's only mentioned a few times in this first book, so maybe he gets a more just portrayal in later parts of the trilogy. The idea of the nornir being villains I found tough to imagine at first; however, I did get into that later in the story. Overall the book is pretty well written and enjoyable, except for the end, when I felt the narrative got a little stuck. For the last few chapters it was simply a repetition of villain arrives, villain defeated. Just once would have been enough, but it happened three times in quick succession. Aside from that issue, though, I had fun with this book and would give it 4 stars. I'd not rush out to buy books two and three at present, but given the opportunity in the future, I would definitely read them.